Several years after the untimely death of John E. Hollenbeck, an early resident of Boyle Heights, whose business activities and land ownership was significant in the Los Angeles region over the short span of the decade from 1875-1885, his widow, Elizabeth, created a "memorial monument" in the form of what was then called The Hollenbeck Home for the Aged. 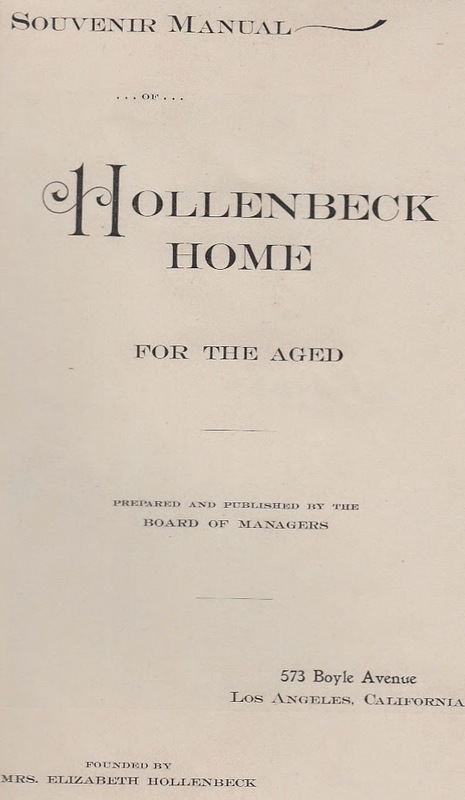 The title page of the "Souvenir Manual" of the Hollenbeck Home for the Aged, now Hollenbeck Palms, in Boyle Heights, published by the facility's Board of Managers about 1900. Click on any image to see it enlarged in a separate window. From an original pamphlet in the collection of the Workman and Temple Family Homestead Museum, City of Industry. Now known as Hollenbeck Palms, the facility for seniors is approaching its 120th birthday, but, after its third year of operation, the home's Board of Managers issued a "souvenir manual," offering information about the facility and some great photos to boot. The pamphlet is not dated, but it does make reference to costs during its third year, indicating that it was published in 1899 or 1900 (it was certainly before October 1901 when a founding trustee, Frank Gibson died). The opening remarks state that the creation of the home was a dream of both Mr. and Mrs. Hollenbeck, but a group of five trustees worked with the widow to put the plan into action. These included John D. Bicknell [the pamphlet shows "Hon. J.E. Bicknell"], who was an attorney for the Southern Pacific railroad, Henry E. Huntington, and the Los Angeles Railway streetcar firm and made a fortune in real estate at Monrovia, Azusa and other locales; James M. Elliott, president of the First National Bank of Los Angeles and heavily involved in water development in the region; Frank A. Gibson, who had a title search firm that morphed into the giant Title Insurance and Trust Company and was also a long-time cashier at First National Bank; Charles L. Batcheller, an attorney and businessman (who also happens to be buried at Evergreen Cemetery in the Heights); and John S. Chapman, an attorney and real estate developer. 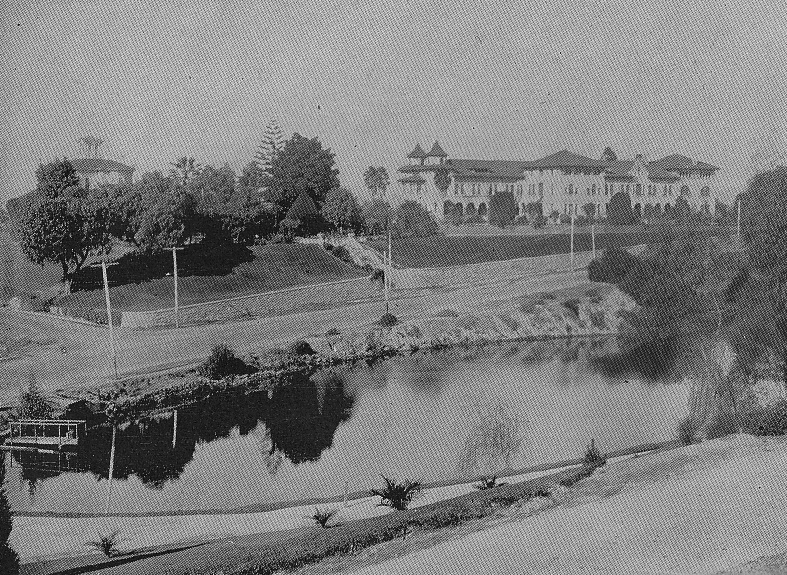 A panoramic view of the 13 1/2 acre property containing the home of John and Elizabeth Hollenbeck (left) and the Hollenbeck Home for the Aged (right) with a portion of Hollenbeck Park in the foreground. Mrs. Hollenbeck deeded 13 1/2 acres in trust to the board, including the house she and her husband built on settling in Boyle Heights in the 1870s. At the north end of the property, the large Mission Revival home was constructed at a cost of $60,000, with an additional $10,000 expended for furnishings. The pamphlet noted that operating costs in the third year (again, 1899 or 1900) amounted to about $10,000. The purpose statement, as given in the document, was to "offer to worthy aged people, residents of Southern California, who are left without means of support, a comfortable home for their declining years." The home was intended, moreover, to be "thoroughly Christian, but not sectarian in its character." On the eleventh anniversary of John Hollenbeck's funeral, the facility opened, this being 6 September 1896. The number of residents in the opening year totaled 46, including 34 women, with two passing away during the course of the year. By the third year, the total was 55, with 3/4 of them women. This is telling, as it may indicate that, either widowed women were often left with little to sustain them or there were unmarried women with no other support. The average age of residents in that third year was 72, with the eldest person being 90. 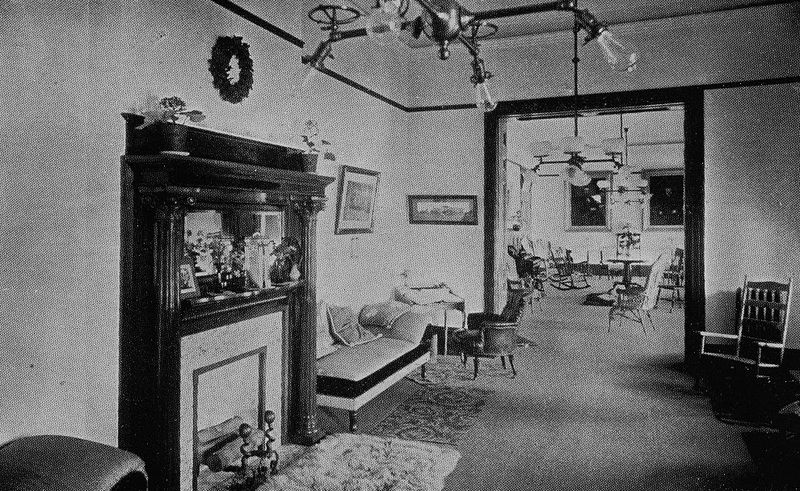 The reception room and parlor of the Hollenbeck Home. Note the cool ceiling fixtures reflecting the fairly recent introduction of electricity in the city. 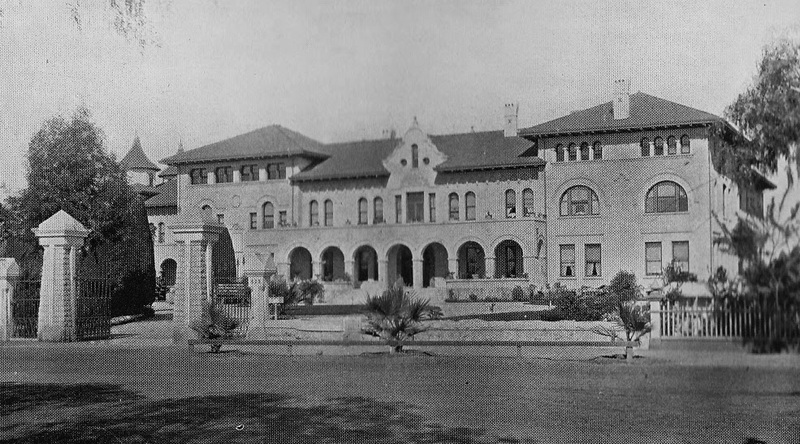 Printed in the publication were the by-laws of the facility, noting that no one who could provide for themselves could live at the Hollenbeck Home. Nor were persons admitted who were considered "deranged in mind or afflicted with any contagious or infectious disease, or any disease considered to be incurable." If an applicant had a physical or mental disability that was "found objectionable," this also precluded acceptance. Residents had to be at least 60 years old and a resident of any of the counties from San Diego to Santa Barbara, including Riverside and San Bernardino for at least three years--interestingly, applications were only accepted on Tuesday afternoons and those approved paid an admission fee of $300 and had to "convey to Mrs. Elizabeth Hollenbeck [or her designees] in trust . . . for the benefit of the Home, all the property, real and personal, belonging to such applicant at the time of admission to the Home." In return, the resident had board and lodging for life. They had to provide their own clothing for at least the first year, after which these would be provided. Another interesting provision was that "members," as they were officially called, were to "render such other service [aside from caring for their own room] as they can for the good of the Home and for the comfort of those who may be less able than themselves." Also listed were the "House Rules," which outlined the duties of the matron, who to "be kind to all alike without partiality" as part of her general responsibilities for the care of "members." In return, residents were to treat her "with deference and respect" and "no member will be permitted to interfere or find fault with her or her assistants." Any complaints were to go to the Board of Managers or their appointed committee. 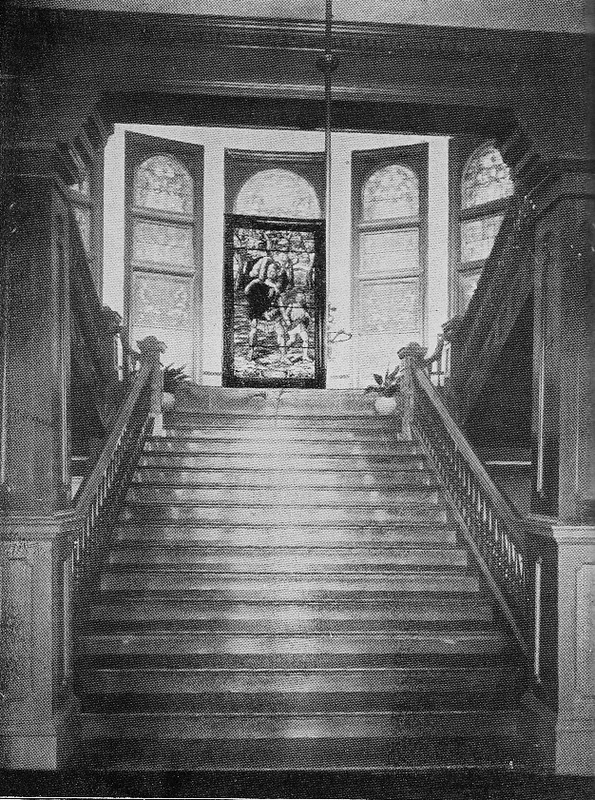 The beautiful stairway and stained glass windows on the landing of the Hollenbeck Home. Members were also required to be in attendance "in the dining hall punctually at the appointed meal hours, unless excused by the Matron." Not only this, but "all are expected to remain seated at the table until the signal is given by the Matron, or her assistant, to arise". They were also expected to "not talk to, nor interfere with the employes [sic] in any way." On Tuesdays, when the Home was open to outside visitors, "members will be at home . . . [and] will have the doors of their rooms open on that day, unless excused . . ." As for visiting among members, "all visiting in each other's rooms should be on invitation—excepting a friendly call on strangers," whatever that meant, with the rationale being that it allowed members to "have full control of their own time." Rule #6 specified that "intoxicating drinks, opiates or strong stimulants will not be allowed, except by the order of a competent physician." Another notable prohibition was that "it is desirable that the Family [of members?] should refrain from the discussion of politics, religion or other exciting subjects." Visitors were not allowed to eat meals or spend the night, unless a physician decided that a member "is so ill as to require constant attention." A view of the Hollenbeck Home for the Aged and its imposing pillared entrance from Boyle Avenue. Religious requirements included a scripture reading or recitation of the Lord's Prayer as a group after breakfast and supper, In addition, the Thursday prayer service mentioned above and a "preaching service" on Sundays were required unless excused by the Matron. And, "social exercises" held on Monday evenings were "expected" so that they would be "as pleasant and profitable as possible." The by-laws and rules are particularly noteworthy for their attempts to control and mold the behavior of "members." In return for lifetime room and board, after paying the $300 admission fee, residents were more or less expected to exchange that security for their freedom and the concept seems entire foreign to our way of thinking over a century later, but telling about the end of the Victorian era. Obviously, the conditions of operating and living in the Hollenbeck Palms facility are markedly different, but the fact that the enterprise is nearing its 120th anniversary is a notable achievement. Post contributed by Paul R. Spitzzeri, Assistant Director, Workman and Temple Family Homestead Museum, City of Industry.